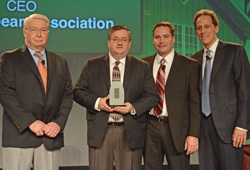 The Eye on Biodiesel Award for Industry Partnership was presented to Kirk Leeds, Iowa Soybean Association this morning. Kirk is Chief Executive Officer of the Association and has been a leader among soybean organizations in supporting biodiesel efforts since the industry’s inception. ISA’s support of the National Biodiesel Board over the years has allowed the industry to prepare and face the challenges of being a billion-plus-gallon Advanced Biofuel. His visionary leadership has helped to maintain a mutually-beneficial, strong connection between the soybean and biodiesel industries. Kirk and ISA have been at the forefront of improving agriculture’s environmental performance. Through partnerships with farmers, environmental groups, agri-business and academia, ISA is helping lead efforts to identify practical solutions for complex environmental issues.